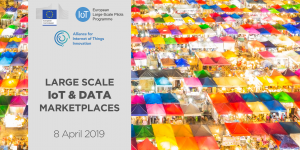 On 8 April, Open & Agile Smart Cities hosted a workshop to discuss the development of large-scale IoT & data marketplaces in Europe. The event was jointly organised by the European Commission, the Alliance for Internet of Things Innovation (AIOTI) and the IoT Large-Scale Pilot Programme. Recording:The event was live broadcasted on Periscope, the recording can be accessed here.